No plain grilled chicken here! 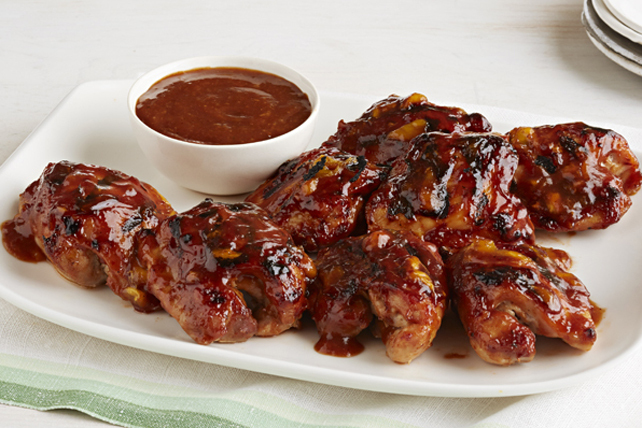 Barbecue sauce plus a few simple add-ins make a delicious marinade for our Mango Barbecue Chicken. Process first 4 ingredients in food processor until blended. Reserve half the barbecue sauce mixture. Sprinkle chicken with pepper. Grill 5 to 7 min. on each side or until done (165ºF), turning occasionally and brushing with remaining barbecue sauce mixture for the last few minutes. Serve chicken with reserved barbecue sauce mixture. When cooking chicken, use tongs instead of a fork when turning the chicken over. This will help to prevent the juices from running out, resulting in a moister, more flavourful cooked product.